I used to be an avid scrap booker- until my second child came along. After Logan came along, I could barely find time to take a shower, let alone do any crafts. Luckily I kept up with my love of photography over these past four years. In the past year, I’ve finally found my inspiration again. It’s been helped along by a great combination of the kids getting old enough to play quietly while I craft, along with new friends who also like crafting. There is something I love about looking at pictures and telling a story about them. Looking back at a photograph is one thing, but adding some nice journaling and pretty artwork makes any picture a work of art. 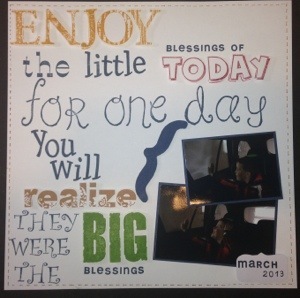 Take this recent scrapbook page, for example. These are snapshots from my phone of Logan as we went through the car wash recently. They’re cute pictures on their own, but they never would have made it off my phone if I hadn’t otherwise found my inspiration again! I’ve been learning some new craft techniques for cards, stamping and more. What’s your favorite trend in paper crafting these days? I’d love to find even more inspiration!